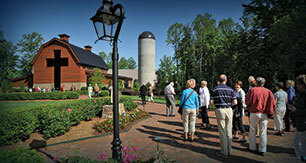 The Billy Graham Library is a living ministry where lives are transformed daily. As films and memorabilia retrace Billy Graham’s journey from a North Carolina dairy farm to arenas around the globe, Library visitors discover the extraordinary things God can do through a life yielded to Him. Select your donation amount below—or become a Friend of the Billy Graham Library by giving a minimum of $20/month to support this ongoing crusade. Friends of the Library receive discounts at Ruth’s Attic Bookstore and the Dairy Bar, enjoy free parking during Christmas events and get a quarterly newsletter with stories and upcoming events. Become a Friend of the Library here.